"SingleHop" Reviews (Apr 2019) - Why 4.8 Stars? Perfect for fast-growing businesses looking for high-performance managed hosting with a minimal investment in IT time, SingleHop makes complex architecture painless to deploy, secure, and manage. Impressive tools automate cloud and dedicated solutions to provide greater control, peak performance, and unprecedented transparency. “Chief Executive Officer Zak Boca and Chief Marketing Officer Dan Ushman launched SingleHop more than a decade ago with the notion that automation could improve IT by reducing deployment time and shrinking the chance for human error. The first to fully automate bare-metal server deployment, the company now enables companies to reallocate IT time away from tedious infrastructure management to product development or strategic projects that move the business forward. SingleHop specializes in premium managed services, top-tier support, and powerful tools to manage dedicated, cloud, or colocated servers. With Zak and Dan's leadership, the company has grown to serve customers in 120 countries and oversee more than 10,000 physical servers and tens of thousands of virtual servers. Mid-sized and rapidly growing companies will appreciate a SingleHop hosting partnership that combines usability with performance, reliability, security, and top-notch support. Although the company's prices are somewhat steeper than several mainstream competitors, we found SingleHop to be very reasonably priced for the level of service, flexibility, and attention customers receive. During the white-glove onboarding process, SingleHop technicians will examine customers' server needs and actual utilization, often resulting in cost savings once the company implements the appropriately sized and configured solutions. Once a customer's hosting architecture is established, the proprietary LEAP control panel allows users to design, deploy, configure, monitor, manage, clone, resize, scale, and decommission all their infrastructure from one platform on any device at any time. With LEAP, infrastructure is deployed in minutes instead of hours, and clients can monitor progress at every step in real time. SingleHop's work and infrastructure are backed by perhaps the best service-level agreement we've seen. Guaranteeing 100% network and power uptime, in addition to 60-minute response times for support tickets and 90-minute hardware replacement, the company's performance against the Bill of Rights SLA tenets is transparently tracked in LEAP. The self-monitoring SLA and freely available performance metrics are prime examples of how SingleHop genuinely strives to provide impeccable hosting and support. Get started on SingleHop now. Laura Bernheim (HostingAdvice.com): This rating is not available yet. We haven't evaluated SingleHop for the "Cheap" option yet as they do not currently offer this type of hosting service. We're always working to keep our reviews up-to-date so check back later! Does SingleHop already offer the "Cheap" option? Let us know. “In the early days of SingleHop, Zak and Dan told us they would transport hardware to datacenters in taxicabs. Now, the company's one-of-a-kind automation means that most dedicated servers will come online in 60 minutes or less. SingleHop's servers fall well within storage, memory, and bandwidth expectations, and they're built with enterprise-grade hardware from the likes of Cisco, Intel, Western Digital, Kingston, and other well-known manufacturers. For those looking for complex or unique configurations, we appreciate how willing SingleHop technicians are to architect and customize hardware, software, and networks to meet customer needs. In addition to the superb LEAP infrastructure management portal, the company is nearing a general release of AI, a centralized platform to manage server operating systems and software environments. More than 120,000 servers have been enrolled in the program's beta. AI, which is installed with a one-line command, unifies operating systems on all virtual and bare-metal servers wherever they reside — whether on-premise, within another datacenter, or hosted in any public cloud. The program automatically monitors uptime and notifies customers when new patches are available. Users can then apply or schedule the update to all applicable servers in just a few clicks. SingleHop operates five SSAE 16-certified datacenters in New York City, Chicago, Phoenix, Amsterdam, and Danbury, Connecticut. Just as customers can choose where to house their server, we appreciate the flexibility SingleHop allows with managed services. The adjustable hosting plans can be modified at will to delegate as many server maintenance and monitoring tasks as the customer desires. Laura Bernheim (HostingAdvice.com): This rating is not available yet. We haven't evaluated SingleHop for the "VPS" option yet as they do not currently offer this type of hosting service. We're always working to keep our reviews up-to-date so check back later! Does SingleHop already offer the "VPS" option? Let us know. Laura Bernheim (HostingAdvice.com): This rating is not available yet. 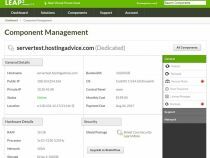 We haven't evaluated SingleHop for the "WordPress" option yet as they do not currently offer this type of hosting service. We're always working to keep our reviews up-to-date so check back later! Does SingleHop already offer the "WordPress" option? Let us know. Laura Bernheim (HostingAdvice.com): This rating is not available yet. We haven't evaluated SingleHop for the "Website Builder" option yet as they do not currently offer this type of hosting service. We're always working to keep our reviews up-to-date so check back later! Does SingleHop already offer the "Website Builder" option? Let us know. SingleHop's award-winning infrastructure control panel, LEAP, provides comprehensive management functionality. Spin up or down infrastructure, contact support, and configure network settings from any device. SingleHop AI, soon to be released, enables a software-defined managed cloud experience with next-generation automation. Through automated patching, intelligent log correlation and alerts, the unified portal consolidates server information no matter where they reside. 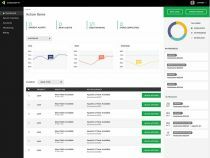 Championing accountability and transparency, SingleHop tracks network availability and performance through a real-time report card. If a service falls short, customers merely need to click a button to get reimbursed. Teams of certified technicians are always available to assist customers. Most customers are connected with a dedicated support team at onboarding, and the company has local, toll-free phone numbers for 12 countries. The company's Bill of Rights Service Level Agreement promises 100% network and power uptime, and SingleHop will credit customers anywhere from 5% to 100% of their invoice. Failing hardware will be replaced within 90 minutes or less. Support tickets are guaranteed to receive a response in less than an hour, with additional updates every two hours. If an issue requires advanced attention, a senior staff member will contact you within 90 minutes. All managed plans include Shield Managed Security for data encryption, event logging, two-factor authentication, and isolated security zones. Upgraded security provides operating system updates, a firewall, and daily log review. Managed DDoS protection and mitigation is automated to identify attacks. Traffic is routed through powerful appliances that divert malicious visitors, mitigating attacks within an average of two to three minutes. Safeguard sensitive data with HIPAA- and PCI-compliant hosting, which is specifically tailored for customers through carefully configured infrastructure, enterprise-grade security, and diligent management. SingleHop's certified experts will manage servers and virtual machines whether the hardware is hosted at the company or elsewhere, including Amazon Web Services or Microsoft Azure. White-glove onboarding ensures customers will be satisfied with expertly designed cloud and dedicated infrastructure. Technicians will help implement new tools and assist with migration. Managed hosting customers can choose which routine tasks to delegate to SingleHop or keep in-house — and make changes throughout the life of the account. Managed services include backups, load balancing, and monitoring, in addition to security, system administration, and routine maintenance. A beacon of flexibility, SingleHop allows public cloud customers to specify the amount of storage, bandwidth, and memory, in addition to the number of processing cores and which operating system they want. Regardless of hosting architecture, however, SingleHop gives users state-of-the-art tools that simplify account and infrastructure management. The LEAP control panel provides on-demand deployment and a real-time service report, while AI automates and streamlines the management, monitoring, and updating of servers and operating systems. All SingleHop solutions are geared toward IT efficiency and usability. With so many options and custom configurations, potential customers might have a hard time finding an estimated price for services without talking to a SingleHop sales associate. We appreciate the flexibility, of course, but wish figures were more readily available. With the company's public cloud hosting plan, customers can be billed hourly for only the computing resources used or receive discounted rates for selecting a monthly billing cycle. Monthly prices range from roughly $45 to $800 per month, depending on the operating system, number of CPU cores, and amount of memory and bandwidth you desire. SingleHop prices are understandably higher than many mainstream, mass-market hosting providers, but customers will be hard-pressed to find companies that offer a higher level of managed services, security, and innovative tools. Most SingleHop services qualify for a dedicated support team, which includes an account manager, along with technical support and a billing department representative. Extended support teams also comprise system administrators, developers, and someone with the datacenter operations team. Access to knowledgeable experts is key, and we like that SingleHop goes a step further by adding the comfort of familiarity. Support is never outsourced. Certified technicians and engineers are available around the clock, and a senior staff member will contact you in less than 90 minutes if the issue requires advanced attention. Support tickets will be answered within an hour and be updated at least every two hours. Although you can call SingleHop support with a local, toll-free phone number in 12 countries, the LEAP control panel often enters support tickets into the queue faster. We'd like to see support delivered via chat, but SingleHop does include the functionality for sales and general inquiries. Perhaps what we love most about SingleHop's Service First Support, however, is the operational transparency. Not only does the company publish all critical network, system, and cloud service data, but SingleHop tracks performance against SLA guarantees, including 100% power and network uptime. If the company does not deliver, customers simply have to click a button to receive an account credit. SingleHop liberates businesses and IT teams by freeing them from both complex and mundane infrastructure management tasks. With a platform built on automation, transparency, and support, the company excels at all flavors of cloud and dedicated hosting. Customers can rely on full-service, white-glove managed services for security, backups, disaster recovery, compliance, or DDoS mitigation regardless of server configuration or location. By creating one-of-a-kind management portals, such as LEAP and AI, SingleHop simplifies and automates infrastructure deployment and software updates. Coupled with an industry-leading SLA and unheard-of accountability, SingleHop is a strong, secure option for growing businesses that can afford to invest in top-notch service.